When Americans look to the future, they see threats on multiple fronts. Majorities are at least somewhat worried about moral values, climate change, the state of our public schools and the soundness of our economic system. The public views providing quality, affordable health care to all Americans, increasing spending for education and reducing the national debt as some of the top policy priorities for the future. And, while these and other issues might benefit from government action, the public has little confidence in government’s ability to effectively address these issues. Instead, Americans look to science and technology as potential problem-solvers for the challenges the country will face. There are deep divisions between Republicans and Democrats over which issues should take priority in the future and what role government should play. The parties are more united in their concern over the functionality of government. 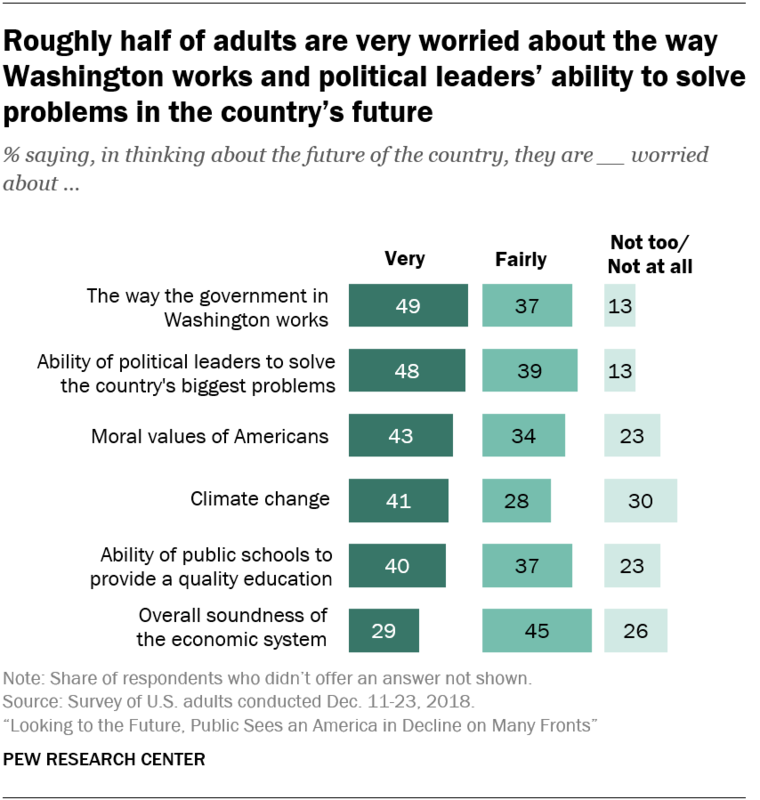 Overall, about half of all adults (49%) say, in thinking about the future of the country, they are very worried about the way the government in Washington works, and a similar share (48%) say they’re very worried about the ability of political leaders to solve the country’s biggest problems. Public worry about the functionality of government is more widespread – and consistently held – than concern over moral values, climate change, the county’s public schools or the economic system. While Democrats and Democratic-leaning independents are somewhat more likely than Republicans and Republican leaners to be very worried about the way the government in Washington works, a large share of those who identify with or lean to the GOP are also very worried about this, too (53% of Democrats vs. 45% of Republicans). Democrats are also more concerned than Republicans about the ability of political leaders to solve the country’s problems: 54% of Democrats and 40% of Republicans are very worried about this. While some Americans are concerned about government overreach in the future, most say they worry the government won’t do enough to address the country’s problems. Six-in-ten say they worry more that, over the next 30 years, the federal government will do too little to solve the problems facing the country, while 39% say they worry the government will be too involved in problems that should be left to businesses and individuals. These views are strongly linked to partisanship. Among Democrats, 79% say they are more worried that the government will do too little to solve problems, while 21% say they worry that the government will be too involved in solving problems. By contrast, a majority of Republicans (62%) say they worry about government doing too much rather than too little (37%). Not only does the public worry about the government’s ability to solve national problems, most Americans think the partisan polarization that characterizes today’s politics will worsen in the future. Roughly two-thirds (65%) of all adults predict that, in 2050, the country will be more politically divided than it is now, while only about a quarter (26%) say it will be less polarized. This is the majority sentiment across most major demographic groups and across parties – 68% of Republicans and 62% of Democrats say the country will be more politically divided in the future. The belief that the country will be more politically divided is strongly linked with worry about the government’s ability to solve the nation’s problems. 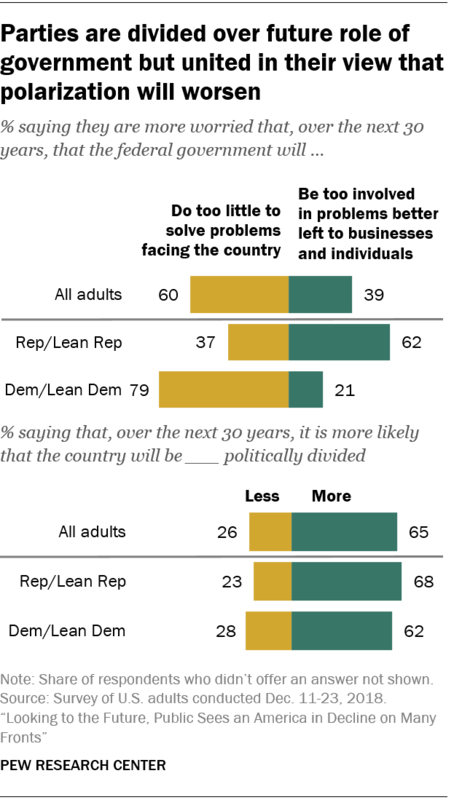 Among those who say the country will be more divided in 30 years, 54% say they are very worried about the ability of political leaders to solve the country’s biggest problems. Those who see less political division are less worried about politicians’ ability to get things done: 37% of those who say the country will be less politically divided in the future also say they are very worried about political leaders taking on important national problems. Roughly four-in-ten Americans (43%) say they are very worried about the moral values of Americans in the future. Similar shares are very worried about climate change (41%) and about the ability of public schools to provide a quality education (40%). Concern about moral values and climate change is strongly linked to partisanship, while worry over the state of public schools cuts across party lines. For Republicans, morality is a top-tier concern. Roughly half (49%) say, when they think about the country’s future, they are very worried about the moral values of Americans. Democrats (36%) are less likely to be very worried about this. Women are more concerned about the country’s morals than men (46% vs. 38%), and there is a significant age gap as well: Among adults ages 50 and older, about half (49%) say they are very worried, compared with 37% of those younger than 50. Across major religious groups, white Evangelical Protestants are the most worried about the country’s moral values: 59% say they are very worried compared with 43% of white mainline Protestants, 44% of black Protestants and 43% of white, non-Hispanic Catholics. Adults who say they are atheist, agnostic or nothing in particular are significantly less worried about this (33% very worried). When it comes to the future of religion in the U.S., the public is divided over whether religion will become less important over the next 30 years (50% say it will) or whether it will remain about as important as it is now (42% say this). Roughly equal shares of white Evangelicals (52%), white mainline Protestants (51%), white Catholics (54%) and those who are atheist, agnostic or nothing in particular (59%) say religion will be less important in the future. There’s no correlation between a belief that religion will be less important in the future and being very worried about the country’s moral values. The level of concern over climate change is similar to that of moral values, but this concern is concentrated among a much different constituency. Young adults are more likely than their older counterparts to say they are very worried about this. Among those ages 18 to 29, 52% are very worried; this compares with 41% of those ages 30 to 49 and 37% of those ages 50 and older. The partisan gap is even wider: Democrats are about four times as likely as Republicans to say they are very worried about climate change (61% vs. 15%). Thinking more generally about the overall condition of the environment in the future, a majority of Americans are pessimistic. About six-in-ten (59%) say the condition of the environment will be worse than it is now by the year 2050, 16% say it will be better and 25% say it will stay about the same. Again, Democrats and Republicans have very different views: 70% of Democrats say the environment will be worse by 2050, while only 43% of Republicans say the same. The public’s pessimism and sense of worry about the future extends to their outlook on the state of the nation’s public schools. Four-in-ten Americans say they are very worried about the ability of public schools to provide a quality education in the future, and an additional 37% say they are fairly worried. Concern about public education cuts across major demographic groups and across party lines. Roughly equal shares of Democrats (38%) and Republicans (41%) say they are very worried about the ability of public schools in the future to provide a good education. Similarly, only about four-in-ten Americans (38%) say the public education system will improve over the next 30 years, while 52% say it will get worse. Young adults are somewhat more optimistic than their older counterparts about the future of public schools: Among those ages 18 to 29, about half (48%) expect the education system will improve, while only 36% among older age groups say the same. Fewer Americans are anxious about the overall soundness of the country’s economic system. Roughly three-in-ten adults (29%) say they are very worried about this, and 45% are fairly worried. Adults from lower-income households express more concern than those in middle- and upper-income households: 34% of those with an annual family income of less than $30,000 say they are very worried about this compared with 27% of those earning $30,000-$74,999 and 22% of those earning more than $75,000. In addition, Democrats are more worried about the future of the economic system than Republicans – 32% vs. 21%, respectively, are very worried. 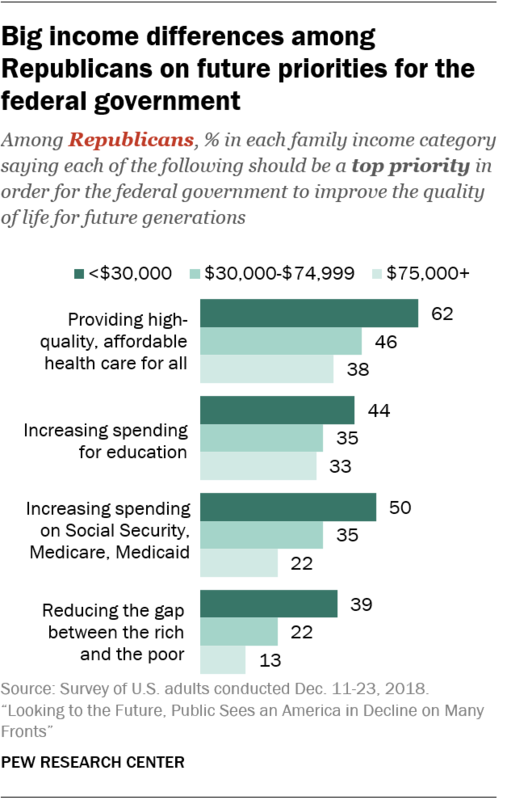 When Americans think about what the federal government could do to improve the quality of life for future generations, their top priorities tend to involve more government spending, although many also place a high premium on reducing the national debt. About two-thirds (68%) of adults say providing high-quality, affordable health care to all Americans should be a top priority for the federal government to improve the lives of future generations. A slight majority (54%) ranks increased spending for education as a top priority, and nearly as many (47%) say the same about increased spending on Social Security, Medicare and Medicaid. At the same time, 49% say reducing the national debt should be a top government priority. Democrats and Republicans have much different visions of what government should do to improve the lives of future generations. 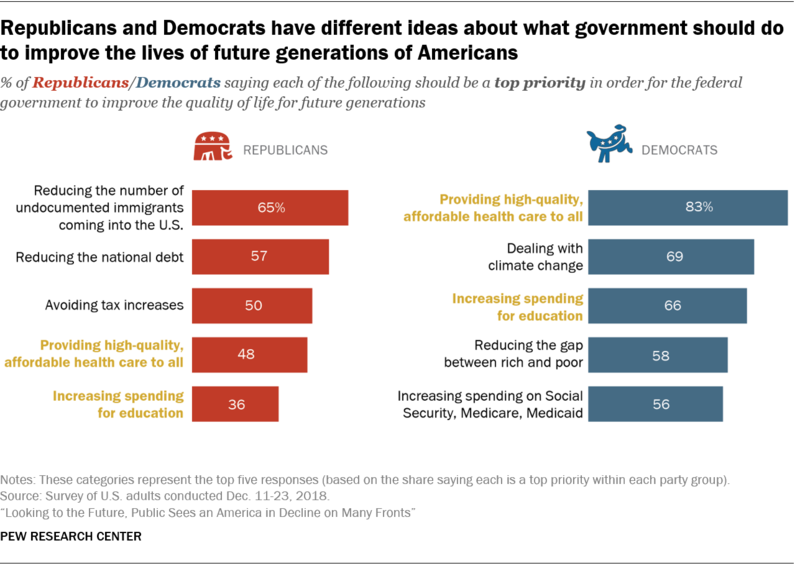 For Democrats, the federal government’s top priorities should be providing high-quality, affordable health care to all Americans (83% say this should be a top priority), dealing with climate change (69%), increasing spending for education (66%), reducing the gap between the rich and the poor (58%) and increasing spending on Social Security, Medicare and Medicaid (56%). For Republicans, the most important steps government should take to improve the lives of future generations include reducing the number of undocumented immigrants coming into the U.S. (65% say this should be a top priority), reducing the national debt (57%) and avoiding tax increases (50%). Many Republicans also prioritize providing health care to all Americans (48%) and increasing spending for education (36%) over other issues but by much smaller shares than Democrats. Overall, the public is less supportive of increasing government spending in other areas. About a third of adults (36%) say increasing spending for roads, bridges and other infrastructure should be a top priority for government in the future. A similar share (34%) say increasing spending on scientific research should be a top priority. And roughly one-in-four (23%) say increasing military spending should be a top priority. Democrats are more likely than Republicans to say infrastructure spending and investments in scientific research should be top government priorities. Just the opposite is true for military spending. Republicans are more than twice as likely as Democrats to say increasing military spending should be a top priority in the future (36% vs. 13%). By contrast, Democrats are more likely to say reducing military spending should be a top priority; 36% of Democrats say this vs. 8% of Republicans. There is relatively little public support for reducing government spending in other areas to improve the quality of life for future generations. 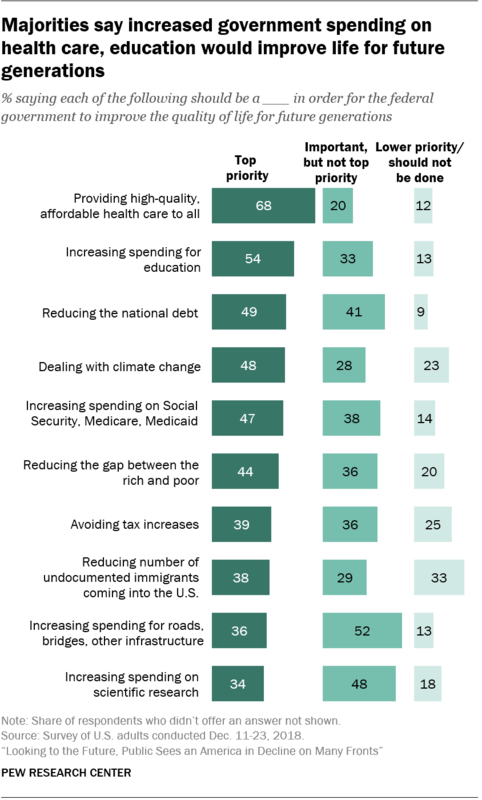 Only one-in-five adults say reducing spending on Social Security, Medicare and Medicaid should be a top government priority in the future, and 14% say reducing spending on roads, bridges and other infrastructure should be a top priority. When it comes to immigration, 17% of adults say allowing more immigrants into the U.S. who come here legally should be a top priority for the federal government. Democrats are more likely to prioritize this than Republicans (22% vs. 10%). In addition to the partisan gaps, there are significant differences in priorities across income groups. Lower-income adults are much more likely than their middle- and higher-income counterparts to say providing health care to all Americans, increasing spending on education and entitlement programs and reducing the gap between rich and poor should be top government priorities. These gaps are driven in large part by differences among Republicans. For example, among Republicans with an annual family income of less than $30,000, 62% say providing affordable health care to all Americans should be a top priority in order to improve the quality of life for future generations. Among Republicans with incomes between $30,000 and $74,999, 46% say affordable health care should be a top priority, and, among those with incomes of $75,000 or higher, 38% say the same. The pattern is similar on views about spending on education and entitlement programs and reducing the gap between the rich and the poor. Although most Americans don’t place a high priority on increased spending on scientific research, many see science and technology as a force for positive change in the future. When asked what kind of impact a range of institutions – including federal, state and local governments – will have on solving the biggest problems facing the country in the future, the public views science and technology as potentially having a greater impact than the others. About four-in-ten adults (43%) say science and technology will have a very positive impact in the future on solving the nation’s problems. An additional 44% say science and technology will have a somewhat positive impact. Democrats have more faith than Republicans in science and technology’s ability to help solve problems: 52% of Democrats but 31% of Republicans say these institutions will have a very positive impact in the future. In addition, those with a bachelor’s degree or more education have a more positive view of science and technology than do those with less education (50% and 39%, respectively, say these will have a very positive impact). In contrast with the faith Americans have in the potential for science and technology, they have very little confidence in government’s ability to tackle the country’s biggest problems. Only 7% say they think the government in Washington will have a very positive impact on solving the nation’s problems in the future; 37% say the federal government will have a somewhat positive impact. More than half say government will have either a somewhat negative impact (36%) or a very negative impact (19%). The public has more confidence in state and local government: 11% say these entities will have a very positive impact in terms of solving the country’s problems, and 52% say they will have a somewhat positive impact. Democrats and Republicans are generally in agreement about the impact the federal government will have in the future. Only 5% of Republicans and 8% of Democrats think the government will have a very positive impact. On balance, Republicans and Democrats are more likely to say the government in Washington will have a negative impact in terms of addressing the country’s biggest problems in the future than they are to say it will have a positive impact. Both parties have a more positive view of the potential impact of state and local governments. One-in-four Americans say they think, in the future, public K-12 schools will have a very positive impact in solving the biggest problems facing the country; an additional 53% say public schools will have a somewhat positive impact. Assessments of colleges and universities are similar: 24% say they will have a very positive impact and 50% say somewhat positive. There are large party gaps in views about the potential impact of educational institutions, particularly when it comes to higher education. Some 87% of Democrats say colleges and universities will have a positive impact (either very or somewhat) in terms of helping to solve the country’s problems; only 56% of Republicans say the same. This echoes earlier findings showing a partisan gap in views about whether the higher education system is generally going in the right or wrong direction. Democrats are also more likely than Republicans to say public K-12 schools will have a positive impact on the country’s future (86% vs. 66%). 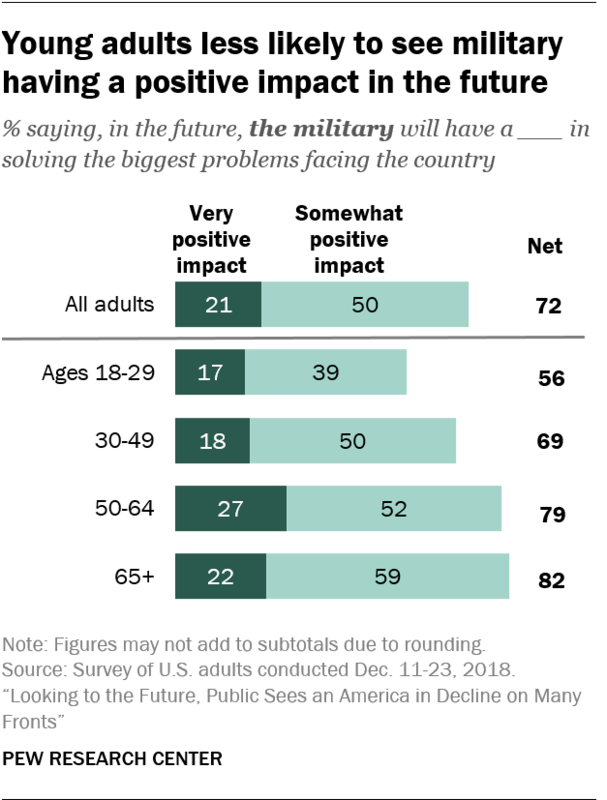 About one-in-five Americans (21%) say the military will have a very positive impact in solving big problems the future, and an additional 50% say it will have a somewhat positive impact. Republicans are twice as likely as Democrats to see the military having a very positive impact (30% vs. 15%). There’s a significant age gap as well, with younger adults expressing less confidence in the military than their older counterparts. While 56% of adults ages 18 to 29 say the military will have either a very or somewhat positive impact in the future, in terms of helping address the country’s biggest problems, 69% of those ages 30 to 49 predict that the military will have a positive impact, and the share rises to roughly eight-in-ten among adults 50 and older. The public is divided over the impact major corporations will have in solving future problems. About half (51%) say corporations will have a positive impact (9% very positive, 41% somewhat positive), and 48% say they will have a negative impact (16% very negative, 32% somewhat negative). The balance of opinion on this is different among Republicans and Democrats. A majority of Republicans (61%) say corporations will have a positive impact, while 37% say they will have a negative impact. Democrats lean in the opposite direction: 57% say the impact of corporations in the future will be negative, 42% say positive. The public predicts the future impact of the news media will be more negative than positive (56% vs. 42%). 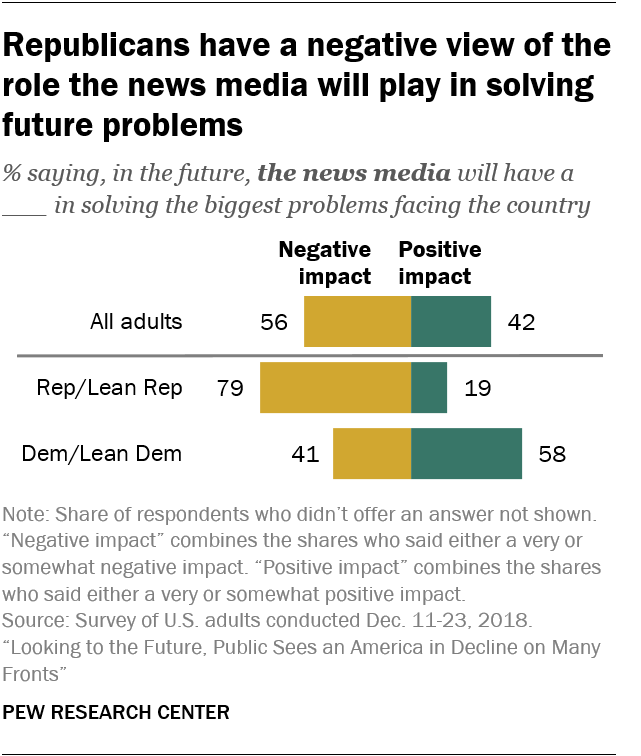 There’s a wide party gap on this issue: Republicans overwhelmingly say the news media will have a negative impact in terms of solving the nation’s problems in the future – 79% say this, including 45% who say the media will have a very negative impact. Among Democrats, 58% say the media will have a positive impact in the future, while 41% say the impact will be negative. Previous research has shown that the partisan gap in views on the current impact of some institutions has widened in recent years, particularly colleges and universities and the news media.